Diana adds her own voice to her blog for sure. When you read her reviews you know that she used the product, tasted it if it’s food, played with it if it’s a toy and shopped if it’s a store or website. Her photos tell stories of her escapades with her daughter and her reviews also. I like the style of her blog especially the layout of her product reviews. I first started blogging in 2006 while I was on mat leave with my first child. My sister-in-law introduced me to blogging and looking back, it was a pretty new and innovative concept, to me at least. Now, blogs are popping up everywhere! 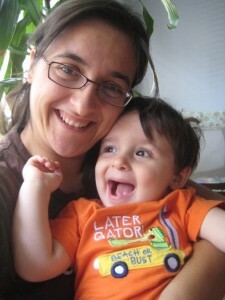 On Toronto Teacher Mom, I write about my life as a mother of two and teacher of many. This has now expanded to include product and service reviews and giveaways, too. I like to talk about products for moms, children and babies, as well as promote local, organic and natural products and businesses whenever I can. I am now looking to add tutorials about how I have edited HTML code to personalize my site because, well… I am a teacher and I love to teach! And I learned a lot from other fellow bloggers, so why not pay it forward? I just wish I had more time to write! My first blog was Toronto Teacher Mom. When I got into crafting with my Cricut Expression last year, I started up a craft blog called Diana’s Designs Blog. It’s been great connecting with people who share my love of paper crafts and learning and sharing ideas with them, too. My biggest tip would be to stay honest and add some original insight. It seems some bloggers just copy and paste info from press releases, etc. and add very little of their own content. It also provided me with the opportunity to work on my writing skills, which I have to say was never my forté. Last year, in late summer, I was contacted by a few PR reps to promote a few products, services and campaigns. I did most of these without any recompense of any sort and didn’t mind in the least. Then my first major product review was for Clorox cleaning products and I was sent a whole whack of free stuff to keep and give away to friends and family. That’s when I started to put some serious thought into doing more reviews and adding more content to my site. Since then, I have been contacted to review products and services about 90% of the time. Lately, I’ve joined some product review sites such as Mom Central, The Product Review Place and Business2Blogger, that work with companies who want to pitch ideas for product reviews. I’m now starting to really reap the benefits of these memberships. I’ve secured some products for review by responding to the companies’ pitch through the sites I mentioned above. Hmmm, this is a tough one. I loved Burt’s Bees Overnight Firming Lotion, Skin MD Natural Shielding Lotion and Clorox Green Works Cleaning Products, which I have yet to write about. My biggest complaint would be not receiving a reply to my emails, especially if I have a question about giveaway details or if I have emailed winners’ information for them to ship out prizes. I love it when bloggers leave comments. I can live without the anonymous “bloggers” who spam. I see an incredible growth in parents who blog and promote word of mouth advertising. But I also see a potential for blogs to become a part of education and teaching. I’m working on creating a blog for my students and learners of French in general. I spend way too much time on the Internet. The current state of chaos in my house can attest to that. I was never much of an avid reader but I remember enjoying the works of Jane Austin, a novel called the House of the Seven Gables, Metamorphosis, No One Writes to the Colonel by Gabriel García Márquez, Madame Bovary and even parts of the Divine Comedy. But nothing will surpass my love for Canadian-based author, Robert Munsch! I don’t own one. Yet. My social life is a work in progress. But I have attended and plan on attending more blogger events in the area. I love email. And Twitter. You can offer any ideas or tips on being a more organized mom. And/or teacher. Oh, and you can enter my giveaways, too! Thanks for posting the interview, Connie! It looks great! Amazing interview thanks for introducing me to Diana … I love her recommendations! I love reading Diana’s blog! It was fun to find out more about her through this post! !